Don't hear anything? Click here for help. 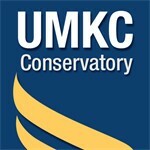 The UMKC Conservatory of Music and Dance is internationally recognized as a center for artistic excellence, innovation, and engagement with our community of about 2 million with more than 300 concerts, recitals, shows, and events throughout the year. In rehearsals, in class, and on stage, our students interact with an exceptionally gifted faculty and with leading visiting artists in ways that are supportive, yet rigorous. Our faculty and students recognized that arts careers in the twenty-first century will blend new works with masterpieces; unite performance, engagement, and education; and above all, will pulse with a sense of adventure and creativity. A community of artists, educators, and scholars, the Conservatory enrolls more than 600 students in a comprehensive array of liberal arts and professional degree programs in Composition, Music Theory, and Musicology; Dance; Instrumental Studies; Keyboard Studies; Music Education/Music Therapy; Vocal Studies; and Jazz Studies.